Poll: Should we add this? We all know the fantastic water bubble bar when we go underwater, but, it doesn't really have that big of an impact. 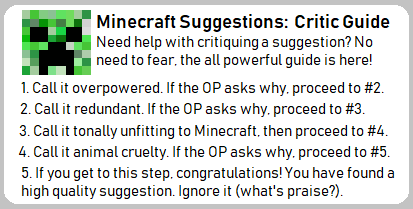 Would if there were more necessities to Minecraft? Today, a great update would lead to Minecraft being more challenging in the overworld, being more of an accomplishment to learning "survival" in general. Survival, obviously means, survival. Which means, temperatures are a big thing when it comes to Minecraft. For example, if you stand in fire, you'll obviously be caught on fire. I mean, it's logical, right? Well, what would happen if you stand in a desert biome or taiga, or ice spikes biome? Nothing. This is why we need a change! When you enter a snowy biome, nothing will happen. But, if it snows, something will change. You'll be given a snowball bar on top of your food bar. You'll have ten snowballs, and every thirty seconds, one snowball will go away. You'll become colder. Basically, you have five minutes to stay there, if you don't find a way out. But, of course, to every problem, there's a solution. To avoid this, you can wear any armor given. This will completely get rid of the snowball bar and you can live happily ever after. In a desert type biome, like the desert or mesa, nothing, also, happens. When it's sunny out and you enter one of the desert type biomes, you will be given a sun bar on top of your food bar if you're wearing armor. If you're not wearing armor, you're good to go. During night time, you must wear armor, and it works the same as the snow biome. SNOW EDIT: In snow biomes, if you have some sort of tunnel or shelter, the bar will go away. DESERT EDIT: As long as you're wearing armor underground in the desert, the bar will go away. I'd rather not have this tedious micromanagement in Minecraft. Nothing about it sounds fun, or even challenging. Just annoying. If you'd read the searched for the many previous temperature suggestions, you'd know that people won't support things just for realism. There needs to be some reason benefiting gameplay. In this case, temperature would only make the gameplay less fun. PS: You really should add a third option to the poll called "Yes, I like this suggestion but not Doges"
The problem is that this would just be another thing to worry about that wouldn't add much in return. If there was finite water, or it was harder to get or something, I can see where this could be more challenging. However, this would just be a tiny thing to annoy the player. Look at the food system: after the first couple Minecraft days, it is pretty pointless, as food is ridiculously easy to get. bad idea what if i was returning to my house in a snowy biome with loads of good loot i would die before reaching my house. "I'm always striving to do more. Whatever I accomplish, it's not enough. I don't get satisfied." Hey guys! I'd like to clear things up. Cows are pretty easy to find, so I don't understand the unsupportive comments towards the snow biomes. Also, Minecraft actually is not really realistic. The Nether, the End, wings, blah, blah, blah. It needs more realism to make the game accompanied by more people who aren't gamers. Anyways, thanks for your opinions. One last thing, there's no such thing as "non-doge supporter." Gameplay is always more important than realism, and the issue I have with this is it doesn't enhance gameplay; it only adds an extra annoyance and make those biomes unlivable. If you spawn in a snow biome, you have to either kill enough cows for armor or run out of the biome quickly (on top of getting a shelter for nightfall and finding food, and for new players, simply getting oriented with the game). Once you have armor the temperature mechanic becomes completely useless. The only thing it adds is making your first day/night harder if your spawnpoint happened to be in a snow biome, and does nothing else. The desert's heat/cold mechanic forces you to have to remove your armor and put it back on, which becomes tedious and repetitive. The end result would be people would get annoyed by these quirks and wouldn't live in those biomes anymore, which isn't what should happen. Biome already have a sort of "weather effect" in the form of strays that slow you and husks that deplete your hunger faster, but those mobs are avoidable. Your game shouldn't become randomly harder based on the randomness of world generation. This would only be a nuisance, and nothing more. If you spawn in a cold/hot biome, you are now going to have to run out of it, or try your hardest to kill a herd or two of cows before you die, which will probably be unlikely. More often than not, people would just make a new world. If you don't spawn in one, you simply avoid it until you get armor, and then you never have to worry about it again. What's the point exactly? It's not "difficult" to go and punch cows for leather. It's not "difficult" to simply not go into a biome. Plus, the reason you give in your latest comment makes no sense at all. You want to make the game more realistic because the game has been made unrealistic, changing what it is an has always been, basically, so people that aren't even gamers can appreciate the game more? What kind of sense does that make? The game has a survival mode, yes, but the main draw of the game is the sandbox functionality. Some people like the little survival additions to make their stuff feel more earned instead of just spawning it in, but blocking off areas of the world is not going to help anyone like the game more.